"From the King of terror, a chilling new dimension in horror." In this horror thriller, a sinister force lives beneath a small Maine town and threatens the town's children in the form of a sinister clown. A group of intrepid kids find themselves as the town's only defense against the ancient horror. This 1990 version of Stephen King's story should not be confused with the 2017 feature-film adaptation. 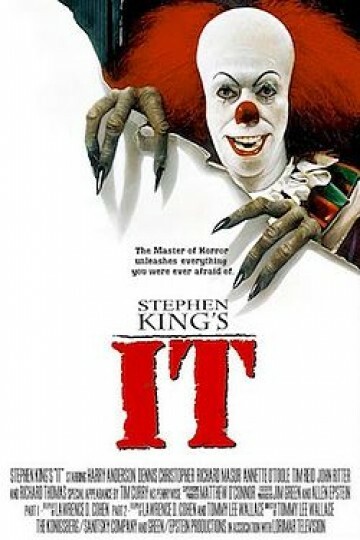 Stephen King's It is currently available to watch and stream, buy on demand at Vudu, Google Play, FandangoNow, iTunes, YouTube VOD online. Get ready for more Stephen King remakes after the success of 'It'. The follow-up to this fall's horror blockbuster now has a definite release date. The horror hit takes the top spot again this week in a photo finish. Last week's top movie won't be the only horror film in town this week. A battle between horror movies will heat up the box office this weekend. Does the horror movie have what it takes to get people going to the movies again? Stephen King and his horrible clown had a blockbuster weekend at the box office. The latest version of Stephen King's classic horror novel hits theaters in September.